The greatest movement to transform business in the first few decades of the 21st Century is not the computer, the internet, or social media. It’s the rise of empowered consumers, who are using these tools, and more, to reshape their relationships with the companies they allow into their lives. This movement affects every aspect of customer contact with a company. But, perhaps most directly, it has substantial impact on the communications between that company and its customers. Those communications, and the customers’ positive or negative impressions of them, can help a company grow or contribute to its downfall. 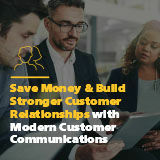 To succeed in this brave new world in which customers are in control, a company’s approach to customer communications must evolve if it wants to retain and grow relationships with them. The company must not simply keep pace with these empowered consumers but also must anticipate and then exceed their expectations. Customer identity has gone mainstream.